The Baltimore Metro rapid rail transit line operates along a 15.5-mile (24.8 km) long route between downtown Baltimore and Owings Mills in the northwest suburbs, with 14 stations serving the communities along the system. The Baltimore Metro rapid rail transit line operates along a 15.5-mile (24.8 km) long route between downtown Baltimore and Owings Mills in the northwest suburbs, with 14 stations serving the communities along the system, and it was built in three sections (opened 8 miles in 1983, 6 miles in 1987 and 1.5 miles in 1995) for a total cost of $1.392 billion. Metro trains are available every eight minutes during morning and afternoon rush hours and every 10-20 minutes other times. Traveling the entire line takes approximately 25 minutes. Free parking is available at all Metro stations between Owings Mill and Mondawmin, inclusive. In addition, many MTA bus lines serve the Metro Subway stations, offering convenient connections to popular Baltimore area destinations. On September 2, 2001, a milestone was reached with Sunday service being added, providing full 7-days-per-week service. Even though most of the Baltimore Metro is aboveground, the term "subway" is commonly used to denote the system, both today as well as in the past back to the system planning stages in the 1970s. The original planning name for the Baltimore heavy rail system was the Baltimore Region Rapid Transit System (BRRTS). That rather unpleasant-sounding acronym gave way to the name Baltimore Metro, which was what the subway was called upon opening on November 21, 1983. "Metro" is a name recognized around the world in many cities for a rapid rail transit system. Further extensions of the Baltimore Metro are desirable, but none are actively planned at this time. Planning studies and maps back in the 1970s detailed an extensive Baltimore region heavy rapid rail transit system 71 miles long, with extensive downtown and suburban coverage similar in concept to the Washington Metro (WMATA). Due to funding limitations, Baltimore today has 15.5 miles of heavy rail transit and 30 miles of light rail transit. Both lines traverse the downtown, and three suburban lines reach the northwest, north, and south suburbs. The light rail extensions provide service to Baltimore-Washington International (BWI) Airport and downtown Pennsylvania Station (Amtrak and MARC commuter rail). The Metro line is completely grade-separated. The light rail system is mostly grade-separated, with the line running on the surface of Howard Street in downtown Baltimore. Baltimore, Maryland, Metro - Map. Maryland Transit Administration schedules for Metro Subway. Serious planning for rapid rail transit (as defined by electric heavy rail transit with railroads with at least 2 tracks and full grade separation, and urban and suburban service with high-platform multiple-unit trains) for the Baltimore area began in the 1960s with an officially sponsored study that resulted in a report published in 1968, looking at engineering and economic feasibility as well as ridership projections. This report provided proposed line locations for a 71-mile-long (114.3 km) regional rapid rail transit system with six radial lines and with a downtown hub, with extensive downtown and suburban coverage similar in concept to the Washington Metrorail system which was also in early planning and design stages then. Due to funding limitations, further studies refined the Baltimore system concept to a smaller 28-mile-long (44.8 km) system report called the Phase 1 Plan, published in 1971, using two lines from the 71-mile system, and the Phase 1 Plan system had a northwest line from the downtown to Owings Mills, and a south line from the downtown to Glen Burnie and Friendship International Airport (today's Baltimore-Washington International Airport (BWI)). The two lines in the Phase 1 Plan had a downtown junction at an underground two-level transfer station at Charles Center. The rapid rail transit south line eventually fell victim to funding limitations and local opposition. See my article Baltimore Central Light Rail Line for details and photos of the 30-mile long Central Light Rail Line. The Central Light Rail Line was built along a similar route to that of the once-planned rapid rail transit south line, and it runs on Howard Street through downtown Baltimore, and it has a north line to Timonium and Hunt Valley in the north suburbs. The proposed 71-mile BRRTS system of 1968 also had a north line to Timonium, but its city routing was a couple miles east of where the Central Light Rail Line was ultimately built. Central Light Rail Line construction spanned 1992-1997, at a cost of $506 million. There have been study proposals in 2000 and 2001 to build a downtown light rail transit loop, and that could possibly entail extending the light rail spur which now terminates at Penn Station (Penn Station handles AMTRAK intercity trains and MARC commuter rail trains), and this extension would loop around the east edge of the downtown and would connect into the existing light rail line near the stadium complex at Camden Yards. The downtown light rail loop would provide better downtown distribution of riders as well as provide more light rail system capacity through the downtown. The new downtown loop line proposals are from 2 to 3 miles long, and would cost from $250 million to $300 million. A $200 million Double Tracking Project is now (in 2001) underway by MTA to double track most of the 1/3 of the Central Light Rail Line system that was built with a single track (the rest was built double tracked). Only the northernmost one mile just south of the Hunt Valley north terminal, will remain single tracked. The Baltimore Metro and the Central Light Rail Line do not have a direct junction station joining them, but each system has a Lexington Market Station in the downtown, one block apart. The whole saga of securing the public financial and political commitments to begin the construction of Baltimore's first subway line, took a number of years and a lot of work at the local, state and federal level. Baltimore like most large cities had an extensive trolley/streetcar system for a number of decades, which gradually became obsolete and gave way to systems of motor buses operating on the road and highway system. Baltimore's last trolley lines closed in 1962. Subway/elevated rail systems in general have much higher average speeds and much higher passenger capacity, compared to the old trolleys. Citizens and political leaders in Anne Arundel County expressed fears about "undesirable elements" coming into their area via the subway, and many transit buffs cite this as the origin of the term "LOOT rail", a takeoff of "light rail" meaning that criminals without cars who live in the city would take the subway to the suburbs, commit burglaries and robberies, and then take the subway back to the city; and that by building a subway to the suburbs, that such crimes would be greatly facilitated. Most people would think this line of thinking to be nonsense, since most people know how to drive and can borrow or steal a car if they have criminal intentions. Still, in some other cities as well, including the D.C. area, a significant number of suburbanites had these kind of general fears about having city subway lines extended out to the suburbs. 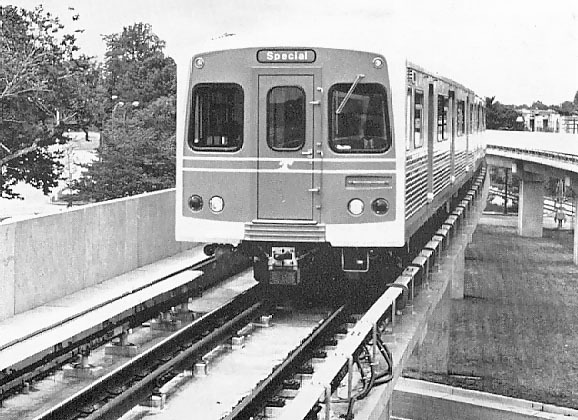 Section "A" of the Baltimore Metro opened on November 21, 1983 at a cost of $797 million. It runs from Charles Center Station in downtown Baltimore to the Reisterstown Plaza Station near the northwest city line. It is 8 miles (12.8 km) long, with the first 4-1/2 miles in subway, coming to the surface for about a half mile, and the remaining 3 miles is on aerial structure. So the stations Charles Center, Lexington Market, State Center, Upton, Penn-North, and Mondawmin are in subway, and West Cold Spring, Rogers Avenue, and Reisterstown Plaza are aerial. Section "A" construction ran from 1976 to 1983, and was the most expensive Maryland public works project up to that time. Completion marked the opening of the first heavy rail subway in Baltimore. Metro trains are up to six cars long. Baltimore Metro train on aerial section of line. Photo by MDOT MTA. Click for larger image: Large (83K). Use "Back" button to return. The system and its trains are powered and operated by electricity, which is supplied to the system by a series of power substations adjacent to the rail line. Traction power to the trains is supplied by a contact third rail, which is on the railroad track bed just outside of the two train running rails. The Operations Control Center for Baltimore Metro is located atop of the Metro Lexington Market Station. The rail yard for service, inspection, repair and storage of rail cars for the Baltimore Metro system is located just off of the main line, near the Reisterstown Plaza Station. Baltimore Metro train stopped at aerial section of line. Photo by MDOT MTA. Click for larger image: Large (78K). Use "Back" button to return. The Section "A" construction started in December 1976, and the estimate for total cost was $721 million, and the projected opening date was in Fall 1982. With a final completion cost of $797 million and actual opening of the line on November 21, 1983, it can be seen that the final product came in fairly close to budget and time. 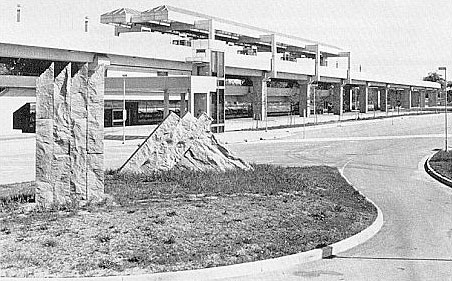 Baltimore Metro rapid transit stations have varied architectural designs. The Washington Metro used common station design themes, and a high vaulted arch in the subway stations. The Baltimore Metro subway stations have the more conventional box structure, but by using differing mezzanine ceiling heights, some of which are quite high, each subway station in the system has its own unique signature from an architectural standpoint. The canopies of the aerial stations also differ from station to station. Charles Center Station - neon tube sculpture by Stephen Antonakos of New York, $64,350. Lexington Market Station - multicolored ceramic tile mosaic adapting ethnic designs by Patricia Alexander of Baltimore, $68,300. State Center Station - mobile sculpture crafted by Paul Daniel of Baltimore, $39,000. Upton Station - glass and ceramic mosaic by Romare Bearden of New York, $114,000. Penn-North Station - abstract environmental work by E. Marc Treib of California, $48,265. Mondawmin Station - backlit photographic montage by R. Thomas Gregory of Baltimore, $85,000. West Cold Spring Station - abstract sandstone sculpture by Jim Sanborn of Washington, D.C., $39,000. Rogers Avenue Station - abstract weathering steel sculpture employing machinery imagery by Gregory Moring of Baltimore, $39,000. Reisterstown Plaza Station - "sun and neon" piece by Rockne Krebs of Washington, D.C., $39,000. Upton Station, mezzanine level. In the rear is the "Baltimore Uproar" 15-by-40-foot glass-and-ceramic mosaic station artwork. Photo by MDOT MTA. Click for larger image: Large (64K). Use "Back" button to return. Mondawmin Station, mezzanine level. 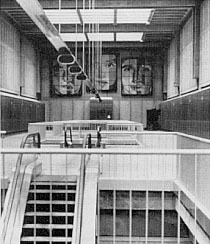 In the rear is the station artwork, photographic montage of faces. Photo by MDOT MTA. Click for larger image: Large (116K). Use "Back" button to return. West Cold Spring Station. Abstract sandstone sculpture in foreground. Photo by MDOT MTA. Click for larger image: Large (219K). Use "Back" button to return. The rail yard for service, inspection, repair and storage of rail cars for the Baltimore Metro system is located just off of the main line, near the Reisterstown Plaza Station near the Baltimore city line. 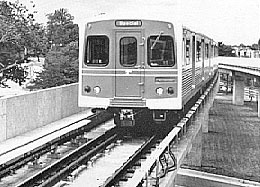 The Baltimore Metro vehicles were built in the same contract as that of the Miami, Florida rapid rail transit system. Both Miami and Baltimore cars are identical except for the paint design. The Baltimore Subway car is the Budd Universal Rapid Transit Car (BURT). It is 75 feet long, 10 feet 2.5 inches wide, 12 feet high, 3 feet 6.5 inches floor height, weighs 76,000 lbs., has 76 seats, has 275 passenger crush load, uses 700 VDC electric power, has a maximum speed of 70 MPH, with minimum horizontal radius of 250 feet, with chopper control, and air conditioning. There are 3 sets of biparting doors on each side. The cars do have train doors at each end, however passenger passing between cars is prohibited. There are air initiated, hydraulic tread brakes that are regenerative, with a dynamic brake also. The cars operate in married pairs, and there is a full width cab at one end of the car. The operator controls are on the left side (same as a bus). All Baltimore Metro stations have island platforms. Baltimore Metro operates 2, 4, and 6 car trains as needed, with station platform length limiting the maximum train length to 6 cars. In addition to the two large and costly transportation systems in the Baltimore-Washington area, Maryland also has a large commercial airport, and the third-busiest port on the East Coast, and a heavily traveled network of Interstate highways and other freeways. Maryland was the first state to establish a statewide Department of Transportation. The Maryland Department of Transportation (MDOT) was created in 1971, and it is comprised of seven agencies, for highways, port administration, airports, mass transit, toll facilities, railroads and motor vehicles. The Mass Transit Administration (MTA) administers the bus, Metro rail and light rail systems in the Baltimore area, as well as the MARC commuter rail systems in the Baltimore area and in the Washington area. Baltimore has the only totally state-operated subway system in the U.S. The Washington Metropolitan Area Transit Authority (WMATA) operates the 103-mile Metrorail system and the Metrobus system in the District of Columbia and its Maryland and Virginia suburban areas. WMATA as a political unit is an interstate compact between D.C., Maryland and Virginia, and the compact includes the localities of the District of Columbia, the Maryland counties of Montgomery and Prince George's, the Virginia counties of Fairfax, Arlington and Loudoun, and the Virginia cities of Alexandria and Fairfax. The states and localities chartered the interstate compact with approval of the U.S. Congress in 1968. WMATA's political structure reflects the interstate nature of bus and rail transit in the Washington, D.C. metropolitan area. MDOT MTA administers the bus and rail systems in the Baltimore metropolitan area, and the whole MARC commuter rail (local passenger trains operating on a mainline railroad) system, which serves both areas. Maryland was the first state to have a full-fledged transportation trust fund, where all transportation tax and fee revenues, including bus and rail fares, are deposited. The MDOT Consolidated Transportation Program (CTP) is the annually-updated TIP (common acronym for transportation improvement program) where transportation trust funds are programmed for allocation over a 5-year period. Only highway toll facilities have their own separate fund, due to a more direct link to state toll revenue bonds. Today in 2001, to meet the needs of travelers and commerce, MDOT operates as an integrated system encompassing six distinct agencies including the Maryland State Highway Administration, the Maryland Transit Administration, the Maryland Aviation Administration, the Maryland Port Administration, the Maryland Motor Vehicle Administration, and the Maryland Transportation Authority. The MDTA is a public enterprise that develops, finances and operates the State's seven toll facilities. Maryland is one of just a few states that include all modes of transportation under one self-financed agency. The State's Transportation Trust Fund finances all of MDOT's capital and operating costs giving the flexibility to direct adequate funding to priority transportation projects across the State no matter what mode of transportation is required to meet Maryland's transportation needs. Transportation needs in Maryland are funded from an integrated account called the Transportation Trust Fund. The Transportation Trust Fund was created in 1971 to establish a dedicated fund to support the Maryland Department of Transportation (MDOT). The use of this integrated trust fund approach allows Maryland a tremendous flexibility to meet varying transportation service and infrastructure needs. The continuing commitment to these needs has provided Maryland with the excellent infrastructure system necessary to support the economic growth of the State. All activities of the Department are supported by the Trust Fund, including debt service, maintenance, operations, administration, and capital projects. Unexpended funds remaining in the Trust Fund at the close of the fiscal year are carried over and are not reverted to the State's General Fund. All funds dedicated to the Department are deposited in the Trust Fund and disbursements for all programs and projects are made from the Trust Fund. Revenues are not earmarked for specific programs; the allocation of funds to projects and programs is made in conjunction with state and local elected officials. Sources of funds include motor fuel taxes, motor vehicle excise (titling) taxes, motor vehicle fees (registrations, licenses and other fees), and federal-aid. In addition, the Trust Fund also includes corporate income taxes, operating revenues (e.g., transit fares, port fees, airport fees), and bond proceeds. Federal-aid projections are based on current appropriations and the match required to meet capital program cashflow requirements. Bonds are issued to support the cashflow requirements of the planned capital program while maintaining debt coverage requirements. Certain Trust Fund revenues are shared with other state agencies and local governments based on statutory requirements. The funds in the Gasoline and Motor Vehicle Revenue Account are distributed 70 percent to MDOT, 15 percent to Baltimore City, and 15 percent to the counties and municipalities based on motor vehicle registrations and road miles. Deductions are also made for certain General Fund purposes, including environmental, fuel tax collection, and state police programs. After the state agency and local government deductions, the remaining funds are allocated for debt service, MDOT operating expenditures, and MDOT capital expenditures. MDOT expenditures are for various modes of transportation: State Highway Administration (SHA), Maryland Transit Administration (MTA and MARC), Washington Area Transit Programs (WMAT), Maryland Port Administration (MPA), Maryland Aviation Administration (MAA), and Motor Vehicle Administration (MVA and ISC). The Transportation Trust Fund permits the State tremendous flexibility to meet the needs of a diverse transportation system. Although Maryland was one of the first states to have an integrated trust fund, it is a model copied by other states. By working closely with the rating agencies and maintaining financially prudent criteria regarding the Trust Fund, the Department has one of the highest credit ratings given to transportation agencies. 1. Baltimore Region Rapid Transit System, Feasibility and Preliminary Engineering, prepared for the Mass Transit Steering Committee, Regional Planning Council, Baltimore, Maryland, July 1968. 2. Baltimore Region Rapid Transit System, Phase 1 Plan, prepared by the Metropolitan Transit Authority, January 1971. 3. "Struggles Continue for Baltimore", Mass Transit magazine, March 1980, article by Kenneth T. Berents, transit reporter for the newspaper Baltimore Sun. 4. "MTA gives BRRTS backseat to Metro", Baltimore Sun, June 1981, article by Tom Linthicum. 5. "Building the Baltimore Region Rapid Transit System", MDOT MTA, about 1981. 6. "Baltimore Welcomes New Metro as Vital to Continuing Renewal", Mass Transit magazine, September 1983, article by Frederic B. Hill, transportation reporter for the newspaper Baltimore Evening Sun. 7. "A Unique City-State Relationship", Mass Transit magazine, September 1983, article by Frederic B. Hill. 8. "Baltimore Metro Opens", Modern Railroads magazine, September 1983. 9. "Baltimore Transit Begins New Era", Transit Today, Maryland Department of Transportation, Mass Transit Administration (MDOT MTA), Fall 1983. 10. "Cooperative Funding Propels Metro From Planning to First Rider", Transit Today, MDOT MTA, Fall 1983. 11. "Section B Goal: 1987", Transit Today, MDOT MTA, Fall 1983. 12. "MTA Looks to the Northeast", Transit Today, MDOT MTA, Fall 1983. 13. "Facts About the Baltimore Metro Car", Transit Today, MDOT MTA, Fall 1983. 14. "Metro Art Improves Environment", Transit Today, MDOT MTA, Fall 1983. 15. "Control Center Voices are Key to Train Movement", Transit Today, MDOT MTA, Fall 1983. 16. "MTA Opens Easy-to-use Baltimore Metro System", news release from MDOT MTA, November 1983. 17. "Baltimore Metro Ready for Passengers", news release from MDOT MTA, November 1983. 18. "Baltimore Metro Accessible to Handicapped", news release from MDOT MTA, November 1983. 19. "Baltimore Metro Stations Feature Specially Commissioned Art Works", news release from MDOT MTA, November 1983. 20. "Baltimore Metro Facts and Figures", handout sheet from Maryland Department of Transportation, Mass Transit Administration, November 1983. 21. "Small as subways go, line is No. 1 among Md. public works", by Joel McCord, Baltimore Sun newspaper, November 20, 1983, Page B7. 22. "Is 8 miles worth $797 million? ", by Joel McCord, Baltimore Sun, November 20, 1983, Page B7. 23. "Cars made of tons of steel, miles of wire - and Velcro", by Joel McCord, Baltimore Sun, November 20, 1983, Page B8. 24. "Stations distinguished by their artwork, and in one case, aromas", by Luther Young, Baltimore Sun, November 20, 1983, Page B8. 25. "Future Metro stations to cost localities more", Baltimore Sun, November 20, 1983, Page B8. 26. "Mayor fears that subway is not being promoted enough", by Patrick A. McGuire, Baltimore Sun, November 20, 1983, Page B9. 27. "Politics, not philosophy, got subway past '76 filibuster", by Patrick A. McGuire, Baltimore Sun, November 20, 1983, Page B7. 28. "San Francisco's BART overcame rocky start as subway pioneer", by Joel McCord, Baltimore Sun, November 20, 1983, Page B9. 29. "Baltimore Metro - A Blessing in Disguise? ", Mass Transit magazine, April 1985, article by Frederic B. Hill, transportation reporter for the newspaper Baltimore Evening Sun. 30. "Baltimore Metro: Two, and Growing", Railway Age magazine, November 1985. See my article Baltimore Metro Subway - Photos, for links to photos of various parts of the Baltimore Metro system. Currently, these are the stations on the article -- Charles Center Station - 5 photos; Shot Tower Station - 1 photo; Johns Hopkins Hospital Station - 4 photos. Copyright © 1997-2002 by Scott Kozel. All rights reserved. Reproduction, reuse, or distribution without permission is prohibited.